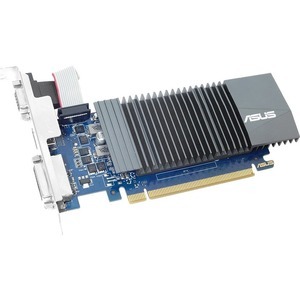 Asus Video Card GT710-SL-1GD5-BRK: what case bracket(s) come with the card (full size and/or low profile) - will go in a Gateway DX4300-04H mid-tower case? According to the information off of Asus website, this does not come with a low profile bracket. Boxed contents are a driver CD and quick guide for installation and setup. You can reach us at (604) 739-8060. ASUS GT 710 is the fantastic graphics card engineered with a highly-efficient 0dB thermal design, it dissipates heat in complete silence and makes ASUS GT 710 the perfect choice for your PC build. While industry only Auto-Extreme Technology, 100% full automation for premium quality and best reliability. GPU Tweak II provides intuitive performance tweaking for truly elite gaming experience.